Heard there are chickens that lay blue eggs? Want one? Then you’re in for a treat – in this article, you’ll discover several chickens that pop out gorgeous, sky-colored eggs! There are quite a few types of chickens that lay blue eggs – and they’re all friendly and wonderful to look at. Why Are Some Chicken Eggs Blue? What Kind Of Chicken Lays Blue Eggs? How Do You Tell What Color Eggs A Chicken Will Lay? Do Blue Chicken Eggs Taste Different? Are Blue Chicken Eggs Safe Or Edible? Are Blue Eggs Better For You? But first – do you know WHY some backyard chickens lay blue eggs? Turns out, it’s a genetic anomaly caused by a retrovirus between 200 and 500 years ago. Chicken breeds that lay blue eggs possess a gene called “callee oocyan” that is responsible for the coloration of the eggs. And unlike other colors, the blue penetrates the egg – so even the inside of the shell is blue! (If you crack open a brown egg, you’ll notice the inside of the eggshell is white – that’s because the brown doesn’t penetrate the shell). No, it doesn’t mean these chickens are sick – it just means a virus caused a genetic mutation that lead to blue eggs. And now we get to benefit. Another common question is whether blue eggs are genetically modified. No, they’re definitely not! They’re completely natural! In fact, all eggs produced by chickens are either white or blue. Here’s why. You might wonder whether there’s chickens that lay dark blue eggs – the color of the egg depends on the individual hen. Although each of these 5 types of chickens lays blue eggs, just understand that the shade of blue might vary. Some might be a pale blue, while others might lay striking sky blue eggs. Want chickens that lay blue eggs? Why not an Ameraucana? Agricultural scientists developed this breed, hoping to preserve the blue-egg laying genes of the Araucana chicken – but also to eliminate its lethal gene that can kill the chick before it hatches. Through trial and error, scientists created these beautiful grey-blue feathered hens. In the 1980’s, they were formally recognized by APA and American Bantam Association (ABA). Even though they look unique, Ameraucanas are easily confused with other chickens that lay blue eggs – the Araucana chicken and Easter Eggers. For those who don’t know the difference, it’s so confusing that you’ll find even hatcheries sometimes mislabel these birds. Ameraucana chickens have a beautiful curved beak, large eyes, and a red “pea” comb. This pea comb, together with the wattles and the round earlobes, should be red. Ameraucana chickens also appear to have a “beard of feathers” and adorable muffs that sometimes almost cover their face. They’re consistent egg layers that produce about 200 blue eggs a year – pretty good statistics! Ameraucana eggs can be light blue to almost green to sky blue – it just depends on the individual hen. You can learn more about Ameraucanas here. Araucanas are wonderful chickens, and truly a unique, ancient breed. They’re also the foundation of every blue egg laying breed out there! This breed is native to Chile, and are named after the Araucania region of Chile. These chickens have a very unique appearance. Like Ameraucana and Easter eggers, they have “peduncles” – tufts of feathers that develop near their ears that they’re born with. Some can have tufts so pronounced, they look like handlebar mustaches! Araucanas don’t have tail bones like most chicken breeds, so they won’t grow any long, fabulous tail feathers. It gives them a distinctive profile that can differ from Ameraucanas and Easter Eggers. Like Brahma chickens and Silkies, Araucanas are born with small pea combs, which makes them ideal for colder climates. It’s less likely they’ll develop frostbite! Adult males weigh about 5 pounds while hens lay about 4 pounds, making them one of the smaller breeds of chickens. Just remember that if you plan to buy these blue egg layers, they should be recognized colors, exhibit the tufts, and be rumpless. You can use these characteristics to be sure the chickens you’re buying are truly chickens that lay blue eggs. Unlike Ameraucana, Easter eggers are hybrids (meaning, they’re not a recognized standard breed). This variety is, usually a mix between Ameraucana or Araucana chickens and a brown egg layer, such as a Rhode Island Red. In other words, Easter Egger chickens can be of any lineage, as long as at least one parent has the blue egg laying gene. While some do lay blue eggs, because of their mixed heritage, not all will. Easter Egger eggs can be blue, brown, green, or even pink – a rainbow of egg colors certain to brighten any basket! Also, they do not breed true, so even if you breed 2 Easter Egger chickens together, there’s no telling what characteristics the offspring will have. No two Easter Eggers look exactly the same. They make wonderful pets (I own quite a few) but if you want blue eggs, it’s best to consider an Araucana or Ameraucana. You can learn more about Easter Egger Chickens here. Cream Legbars are a breed developed in the 20th century by researchers at Cambridge University by crossing a heritage breed like Barred Plymouth Rocks, Leghorns, Cambars, and Araucanas. They’re medium-sized birds, with cream colored feathers. The hens aren’t very broody – so egg collecting should be easy! They have adorable tufts of feathers on their heads – so they’re a sure show-stopper! This variety lays about 200 blue or blue-green eggs each year. You can buy Cream Legbars from Greenfire Farms along with other breeders – just make sure to go to one with a good reputation. This variety was developed in Arkansas (hence its name) at the University of Arkansas-Fayetteville. Although derived from Araucana bloodlines, these chickens don’t have the muffs, tufts, or beards. They do have the pea comb, however. While still a new breed that’s not recognized, the chickens do lay blue eggs. In short, when it comes to chickens that lay blue eggs, you can’t really tell what color eggs they’ll lay unless your hens are purebred Araucana, Ameraucanas, or Cream Legbars. In a general sense, though, brown egg layers have red earlobes. However, you’ll likely notice that Easter Eggers, Ameraucanas, Araucanas, and even olive eggers have red earlobes! So, the easiest way to tell what color eggs a chicken lays is to either purchase purebred hens OR wait and see what pops out! NO! They taste just like any other egg (maybe even better if your hens have an organic diet with herbs included!). And they’re just as healthy! In fact, the nutritional quality of an egg depends completely on the health of the hen and her diet. It’s a common misconception to think that eggs of different colors taste will taste weird, however. Eggs generally do not taste different when the hens eat the same chicken feed and live under the same conditions. If you want to make sure all your chickens eat the same diet, you can read our review of chicken feeders here. There’s several automatic feeders that make it easy to track how much your flock is eating. You can read more about what to feed a chicken for great tasting eggs here. Yes! The color of the eggs doesn’t make it taste any different as long as the hens are fed the same consistent diet. The color of the egg just effects the look of the eggshell – not the nutritional value. 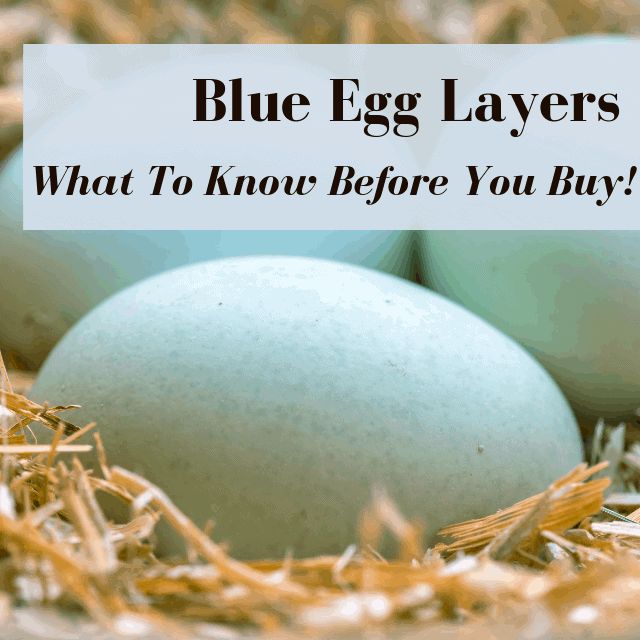 Chickens that lay blue eggs – like every other chicken – should have a diet that includes a high quality commercial layer feed to ensure the highest quality yolks. While some health food proponents claim that blue eggs contain less cholesterol than the regular white or brown eggs, it has been proven false by scientific data. The color of the egg doesn’t effect its quality – just the diet of the hen! Which breed of chickens that lay blue eggs is for you? Leave a comment below! Heard there are chickens that lay blue eggs? In this article, you’ll discover several chickens that pop out gorgeous, sky-colored eggs! Absolutely great information. I have been entertaining getting a blue egg layer. Go for it! All the breeds I mentioned are really friendly.